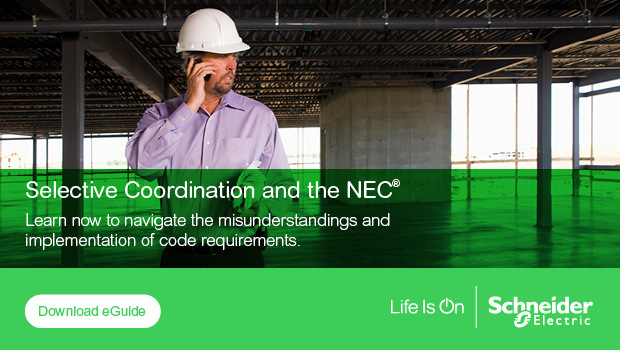 This is the fifth in a continuing series of posts focused on a range of design and specification issues related to the National Electrical Code® (NEC®) requirements for selective coordination. In my previous post, I provided an overview of molded-case circuit breakers (MCCBs) and how their various functions relate to selective coordination. In this post, I’ll offer some specific guidelines for designing selectively coordinated installations using these products. To be successful, selective coordination needs to be addressed at numerous points throughout a project’s timeline. This begins with initial selective coordination studies and continues all the way through to equipment installation. The following guidelines can help ensure your plans perform as intended and meet NEC requirements. Conduct preliminary short-circuit and selective coordination studies before letting jobs out for bid. This will give you assurance that your design can be selectively coordinated. When conducting selective coordination studies, the ground-fault protection must be coordinated with the downstream phase overcurrent devices, not just the downstream ground-fault protection. The Time-current curve (TCC) of a thermal-magnetic circuit breaker can sometimes be nested underneath the TCC of an upstream electronic trip circuit breaker. If there is no overlap of the TCCs at any point below the available short circuit current at the downstream panel, the circuit breakers are selectively coordinated. If there is overlap in the instantaneous region, use the selective coordination tables provided by the MCCB manufacturers. It is possible to mix overcurrent protective devices (OCPDs), i.e. circuit breakers from different manufacturers or circuit breakers and fuses, using TCCs so long as the fault current does not exceed the instantaneous trip point of the upstream circuit breaker or current limiting point of the upstream fuse. If this is not the case, then it may not be possible to mix such OCPDs. One exception to this rule is a circuit breaker feeding a current limiting fuse, so long as the peak let-through current of the fuse does not exceed the instantaneous trip point of the circuit breaker. Conduct a preliminary short circuit study from the source that can potentially produce the highest short circuit current to the bottom of the system. Conduct a preliminary short circuit study from the other source to the first bus on the load side of the transfer switch(es). Make sure the generator protection devices coordinate with the downstream circuit breakers. Some gen sets come equipped with electronics that control all of the functions of the gen set and will take the unit off line if a high fault current is detected. Some manufacturers provide a time delay on this function. Make sure automatic transfer switches have an adequate withstand rating. Transfer switch ratings may be dependent on the upstream circuit breaker opening instantaneously under high fault conditions. If the instantaneous trip function of the circuit breaker feeding a transfer switch has been turned OFF to achieve a high level of selective coordination, the withstand capability of the transfer switch may be exceeded. Some transfer switch manufacturers may offer switches with higher withstand ratings, up to 30 cycles. Or, it may be necessary to move the switch away from the source or to increase the frame size of the switch. Don’t feed lighting panelboards from lighting panelboards unless there is a transformer in between. Consider using main lugs panels, particularly at 277 V. Don’t daisy chain panel risers. In general, better levels of selective coordination are available with 225 A and larger panelboards. Consider using panelboards that have been specially designed for selective coordination applications. Starting from the bottom of the system, coordinate the branch lighting panels first, then the power distribution panels, then the switchboard or switchgear. The upstream circuit breaker should be at least one frame size larger than the downstream circuit breakers. This may necessitate increasing the size of panelboards and feeder conductors. When selectively coordinating systems with low voltage transformers, use the higher protection limits in National Electrical Code (NEC) Article 450. Consider using panelboards that have been specially designed for selective coordination applications when fed from 30 to 75 kVA transformers. Very high levels of selective coordination may be achieved by using high amp frame electronic trip circuit breakers with low amp sensors and/or lower ampere rating adjustments. Change the upstream circuit breaker to an insulated case circuit breaker or a low voltage power circuit breaker. If the desired level of selective coordination cannot be achieved using a 480Y/277 Vac panelboard, consider feeding a 208Y/120 Vac panelboard through a transformer. Split up some of the loads using multiple smaller transformers. Insert impedance by using a longer run of wire, 1:1 or higher impedance transformer or reactors. Make sure busway has adequate withstand ratings. This concern mimics the one just discussed for transfer switches. Selective coordination may impact arc flash incident energy levels. It may be possible to reduce the incident energy by utilizing Zone Selective Interlocking (ZSI) or circuit breakers with a ½ cycle time delay in the instantaneous function that have been specifically designed to achieve higher levels of selective coordination. Don’t neglect to properly adjust circuit breakers in the field as they are usually shipped from the factory with all but the ampere-rating switch in the lowest position. In my final post in this series, I’ll answer some frequently asked questions we’ve received at Schneider Electric regarding the best means for achieving selective coordination with MCCBs. In the meantime, our experts are on-hand to answer questions you might have now, regarding selective coordination and a range of other electrical-design issues. Visit the Schneider Electric Consulting Engineer portal for online resources and direct connection with experts, via phone, email and web chat.